The Universe comprises of everything that exists from the galactic super clusters to the tiniest sub-atomic particles and has a radius of about 46 billion light years with age about 13 to 15 billion years. Asteroids are rocky bodies’ up to 800 kilometres in diameter, although most are much smaller with diameter less than a kilometre. The asteroid belt is the circumstellar disc in the Solar System located roughly between the orbits of the planets Mars and Jupiter. It is occupied by numerous irregularly shaped bodies called asteroids or minor planets. They are made of rock and stone. 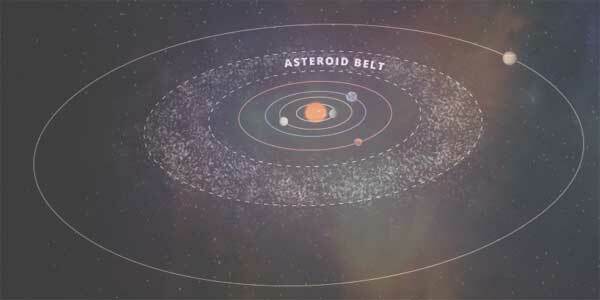 This is consists of, at least 40,000 asteroids that are more than 0.5 miles across. The dwarf planet called Ceres orbits the Sun in the asteroid belt. It is a stony asteroid, classified as near-Earth object and potentially hazardous asteroid of the Amor group. It was discovered by astronomers of the LINEAR program at Lincoln Laboratory's Experimental Test Site near Socorro, New Mexico, in the United States on 1 February 2002. It is a highly elongated, stony asteroid, near-Earth object and potentially hazardous asteroid of the Apollo group. It was discovered by astronomers Albert George Wilson and Rudolph Minkowski at the Palomar Observatory in California, United States on 14 September 1951. It will not intersect the Earth until 2586. Its orbit has an eccentricity of 0.34 and an inclination of 13° with respect to the ecliptic, so it is also a Mars-crosser asteroid. It is an elongated, stony asteroid and slow rotator and considered as near-Earth object and potentially hazardous asteroid of the Apollo and Alinda group. It was discovered by French astronomer Christian Pollas at Caussols in 1989. It passed to the Earth in 2016 but according to the International Space Agency, it will not make another notably close approach until 2069. It is stony and extremely eccentric asteroid and sizable near-Earth object of the Apollo group. It was discovered by American astronomer Henry L. Giclas at the U.S Lowell Observatory in Flagstaff, Arizona, on 12 December 1947. According to the International Space Agency, it is a potentially hazardous celestial object due to its size and its Earth minimum orbit intersection distance (MOID) of 0.0031 AU (460,000 km), which is only about 1.2 lunar distances. It is a vestoid asteroid considered as a near-Earth object. It was discovered by American astronomer Charles Kowal at Palomar Observatory in San Diego County, California on 6 March 1973. It has a low minimum orbit intersection distance with Earth of 0.0036 AU (Astronomical unit) but still listed in a potentially hazardous asteroid list. It is rare-type asteroid and considered as near-Earth object and potentially hazardous asteroid of the Apollo group. It was discovered by the German astronomer Cuno Hoffmeister at Boyden Observatory in Bloemfontein, South Africa on 5 June 1959. As per International Space Agency, it will approach to the Earth in the 21st century. It revolves on the eccentric orbit, so it is also a Mars and Venus-crosser. It is a stony trinary asteroid of the Amor group and considered as a near-Earth object and potentially hazardous asteroid. It orbits the Sun at a distance of 1.0–2.5 AU once every 2 years and 4 months (859 days); the orbit has an eccentricity of 0.42 and an inclination of 22° with respect to the ecliptic. Hence, space agencies predicted that it has minimum orbit intersection distance (MOID ≤ 0.05 AU) and has potential to intersect the Earth. It is an eccentric asteroid and suspected contact-binary, considered as near-Earth object and potentially hazardous asteroid, approximately 2 kilometres in diameter. It belongs to the Apollo group of asteroids and is a relatively slow rotator. It was discovered by the Belgian astronomer Eric Elst and Bulgarian astronomer Vladimir Shkodrov at Rozhen Observatory on 22 September 1987. It had passed from the Earth on 14 August 2000. It is a stony asteroid, classified as potentially hazardous asteroid and near-Earth object of the Apollo group, approximately 2 kilometres in diameter. It was discovered by astronomers of the Lowell Observatory Near-Earth Object Search at Anderson Mesa Station near Flagstaff, Arizona on 11 April 1999. Its orbit has an eccentricity of 0.49 and an inclination of 5° with respect to the ecliptic. Hence, the number of space agencies predicted that in future it will intersect with Earth in 2021, 2032 and 2043. It had already approached the Earth in 2010 but was crossed with marginal distance. It is a carbonaceous asteroid in the Apollo group discovered by the LINEAR Project on 11 September 1999. According to the latest research, it has 1 in 2700 chance of hitting Earth on the 21th of September 2135. It is considered as the potential hazardous celestial body on the list of the Sentry Risk Table. It is 54 million miles from the Earth and orbits Sun. The above asteroids are considered as potentially hazardous object because of their high eccentricity and an inclination degree with respect to their ecliptic orbit.